In a large pot melt butter over medium heat. Stir in brown sugar and corn syrup. Bring to a boil; boil for 3 minutes. Remove from heat. Stir in sweetened condensed milk. Return to heat. Boil for 3 more minutes. 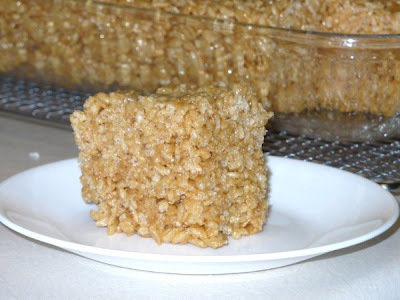 Stir in Rice Krispies if your pot is big enough; otherwise pour caramel over Rice Krispies in a large bowl, and stir to coat. Pour into greased 9x13 (or larger) baking dish. Let cool and cut into squares. 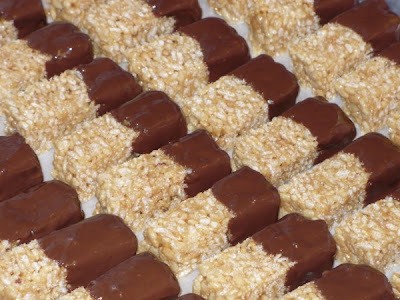 I think I might try cutting these into small squares and then coating them in chocolate. Doesn't that sound sinful? Update: I made these and they are delicious. I melt one part semi-sweet and one part milk chocolate chips and then dip. 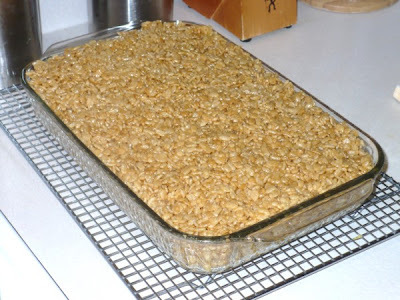 Place on wax paper-lined baking sheet until chocolate solidifies. You can speed this process by placing them in the fridge.